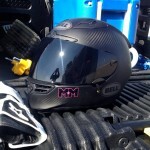 I got a new helmet for this season, a Bell Star Carbon (fiber). It has a Snell rating which is required for NHRA tracks. I have plans to add pink to it to make it a touch girly. Thank you to Bell for the support!